WATERTOWN, Mass.--(BUSINESS WIRE)--Jan. 28, 2019-- Results of a new study released today show that working women face a negative effect on their careers as they grow their families, and yet the same study shows working women bring skills to the workplace that can actually make them the best leaders. According to Bright Horizons’ (NYSE:BFAM) fifth-annual Modern Family Index, 72 percent of both working moms and dads agree that women are penalized in their careers for starting families, while men are not. Despite being viewed by their peers as possessing the qualities that make for strong leaders, working moms find they come up against roadblocks at work. A full 78 percent believe they must prove themselves more than others to gain a leadership position at work. 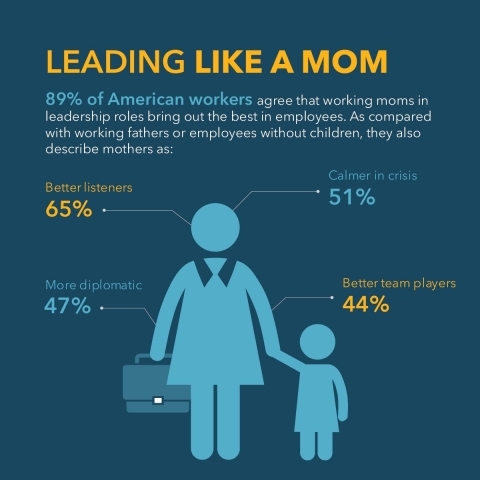 And with leadership roles often dominated by men, almost two in five (37 percent) working moms worry that they do not fit the leadership mold. The fifth annual report in Bright Horizons’ Modern Family Index (MFI) series, conducted by Kelton Global, offers concrete data showing that working moms are the best equipped to bring 21st century leadership skills to the workplace. According to the survey, those who “lead like a mom” may be the missing ingredient businesses need to realize their full potential. Working Americans almost unanimously agree (91 percent) that working moms bring unique skills to leadership roles, and 89 percent feel they bring out the best in employees. Nearly twice as many working mothers are nervous to tell their boss they are pregnant than five years ago (21% vs 12%), and over three in five (65 percent) women without children worry what having a child will mean for their career. Americans believe working fathers are more dedicated to their careers than working moms (75% vs 59%). Bright Horizons’ Modern Family Index is an online survey conducted by Kelton Global from October 29 until November 8, 2018.The sample consisted of 2,143 working Americans over the age of 18 (994 Parents, 1,149 non-parents). The survey has a margin of error of +/- 2.1%. Bright Horizons is trusted by families around the world to provide care and education for their children. Operating more than 1,000 child care centers, Bright Horizons cares for approximately 116,000 children annually in the United States, the United Kingdom, the Netherlands, Canada and India. Used by more than 1,100 of the world’s best employers across industries, Bright Horizons back-up child and elder care, education advising, tuition program management, and student loan repayment programs support employees through every life and career stage, and help people succeed at work and at home. For more information, go to www.brighthorizons.com.